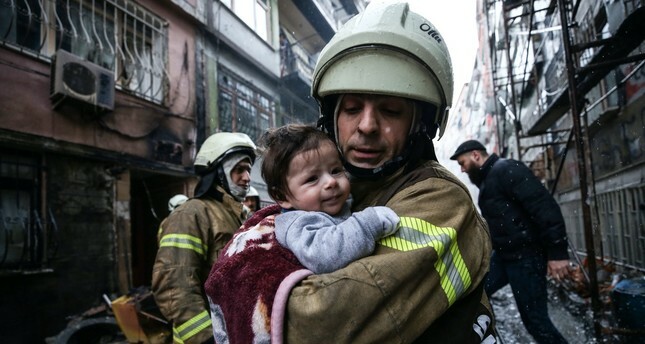 A firefighter saves a baby from house fire due to a natural gas explosion, Fatih, Istanbul. Firefighters who work in Istanbul 24/7 and observe the warning lights that will turn on according to the type of fire in the station to respond to the scene accordingly compete with the world at the speed of fire responses. Anadolu Agency (AA) witnessed the daily lives of the employees working at fire stations in Maltepe, Avcılar and Beyoğlu in Istanbul. The shift change at Maltepe Station is carried out at 9:45 a.m. The team, working one day and one night, is transferring the shift to newcomers. During the shift change all the staff are gathered, and reports of the events of the last day are shared. The employees then say the traditional "fireman's prayer." "My God, give me strength so that I can come to the help of an endangered creature, especially a small child or elder before it is too late. Increase my knowledge, techniques and experience in firefighting. Do not lessen my love and my courage. Include me in the secret of the divine message that you have protected our father Prophet Abraham from burning. If my fate is to die, protect my children, my spouse and my relatives." The firemen who took over the shift after the prayer check the tools and equipment they will use for the next 24 hours. This is among their daily routines, and it prevents any trouble in the operation of the equipment in case of a fire response. A firefighter's helmet, which he took off after responding to a fire in Istanbul. After the shift change, the staff is planning the daily work. Apart from a fire response, the privates and the commander in charge also conduct the response training to fire and traffic accidents, search and rescue, and transport of the wounded both through applied training and videos. The firefighters also provide training for students coming to the station from the surrounding schools to teach them how to behave in fire and emergency situations. In the trainings, the students wear the firefighters' clothes and are informed about the fire. In the station, the privates and commanders even eat their food without taking their eyes off the lights that can turn on any minute. There is also a gym for the firemen to spend their leisure time. It is obligatory to exercise for a minimum of one hour per day. In addition, firefighters can play billiards and tennis in their spare time. Firefighters assemble at 9:45 a.m.
At the Avcılar and Beyoğlu fire stations, the shift starts with the 9:45 a.m. gathering. "Prayer" is said after the reports of the last day are shared. After the prayer, the whole team does routine daily planning, and the maintenance of the tools and equipment such as the pipes used in the fires are reviewed. The cleaning of buildings and equipment is also done by the firefighters. Firefighters working in the megacity of Istanbul work seven days a week and 24 hours a day to respond to fires. Firemen are observing the yellow, green and red lights at all the points, including the toilets, at the stations, to respond to the scene on time. After the call, the staff takes off according to one of these three colors. Every color has a different meaning. The "yellow" light covers small fires, chimney fires, traffic accidents and auto fires, and the crew responds with a vehicle they call the "chimney truck." The "green" light is turned on in evacuation situations such as human evacuation from a building or animal rescue, and the firefighters respond with a ladder. The "red" light is turned on for fires at a residence or workplace. The firefighters take off with a water truck and a ladder. The most sensitive situation for the firefighters is when all the lights are turned on at the same time. In this case, it is understood that the incoming call is from a public building, hospital, school or a high-rise building, and the whole station responds in this regard. The Istanbul Fire Department works under difficult conditions, and their reflexes of responding to the events are always at the top. But besides these difficulties, firemen often suffer from some incidents. The fact that sensitive citizens in the city call the department for a cat climbing a tree leads to an increase in the workload of the teams. down in the same way. The workers say that sometimes there is a waste of time due to the "cat rescue" calls, and in some case, there is difficulty responding to the fires. The firefighters, who express their sensitivity to animals, underline the fact that animals such as "dogs and cats falling into a well and seagulls or pigeons trapped in a chimney" have been rescued many times by their own teams. The response time of the Istanbul Fire Department, which serves a city of 15 million people with about 4,000 personnel, has fallen to an average of five minutes and 23 seconds. It is said that this coincides with the New York Fire Department, which serves in the city with a population of 8 million with about 12,000 personnel. The origin of firefighting in Istanbul, which has experienced the greatest fires in history, is based on the ordinance of Ottoman Sultan Murad III on March 12, 1579. According to the ordinance, everybody was obliged to have a ladder reaching the roof of their houses and a big barrel full of water, and in case of a fire each member of a family would extinguish the fire in collaboration until Janissaries (Ottoman soldiers) and other people came to help. Firefighting, which became a regular concept with the establishment of Tulumbacılar, a water-pumping brigade, is now carried out by trained personnel using the latest facilities in technology from helicopters to ambulances, ladder vehicles and fire response robot and Multifunctional Robotic Response Vehicle (Koca Yusuf). Affiliated with the Istanbul Metropolitan Municipality, the Istanbul Fire Department serves at 120 stations in the city for the peace of citizens with their eyes on the light 24/7. Even though they have problems in terms of the number of personnel, the city's fire crews are working for the people of Istanbul to live in peace with the training they have received from their highly experienced trainers.